Someone has to be very lucky to get incredible shots of wildlife without spending quality time in the wild. For example, it took me a few years and umpteen number of safaris before I managed to shoot my first Tiger in the wild. Perhaps this is why its good to have a quick discussion on this topic. Wildlife is more accessible these days with Wildlife Tourism becoming a trend among youngsters and photogs. However, access to such wildlife locations are often very expensive too. Nothing in the world is generally easy and I know a lot of people who have spent large amounts of money making quick trips to boast about their journeys but with not so justified images to show for it. As the saying goes “no pain…no gain” holds true. A focussed approach to a wildlife subject with patience with a decent serving of luck, can go a long way in capturing a rare moment that stands apart. During Safaris, I often take the help of experienced drivers and guides. There have been instances where we spend generous amounts of time waiting for something to happen. With my favorite subjects, birds, I usually take a recce (walk around) approach to identify good spots and then I settle in at a location to allow the wildlife to settle down also around me. Many a times, I have returned home empty handed but sometimes with waiting, I have got some pictures that turned out to be amazing. I couldn’t have got them any other way. When you see the pictures on my feed it may look like my life is all about a lot of jet-setting around the world to lounge in exotic locations clicking pictures. And while that's true, the "lounging" part is really more like hours of often uncomfortable waiting, and the "exotic" part is equal amounts of beautiful and usually dirty, hot, wet and bug-infested locations. So, if you are planning to get into wildlife photography anytime, get ready to be patient and perseverant. Are you trying to create some pictures with a difference? or perhaps in your early days without knowing camera settings properly, did you create some artistic blur shots accidentally? Well, let's put some method into this madness. 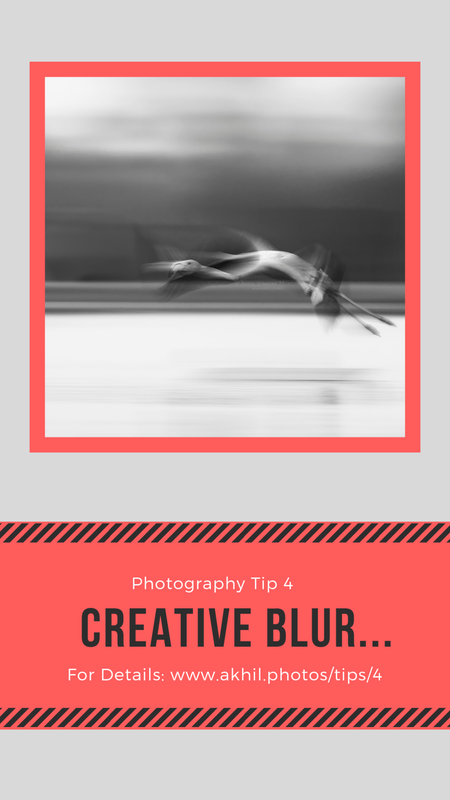 In this photo tip, I will briefly discuss some techniques into achieving creative blur that can leave your images aesthetically impressive and appealing. There are mainly two types of blur effects that can be created optically using a camera and a tripod/beanbag/support is a must to avoid unexpected or unpleasing results. If you are shooting in broad daylight, you may need an ND filter or polarizer to attain slow shutter speeds at wide open apertures which are vital to such effects. Shooting during early mornings or late evenings with less light can be beneficial to this technique and help avoid use of filters. This is achieved by combining a slow shutter speed with camera motion to create a sense of speed around a moving object. It is a way to keep your subject in focus while blurring your background. Panning is usually done on a subject moving horizontally, such as the flamingo in the picture. It takes practice to achieve the effect but the first step is to keep a shutter speed between 1/20th to 1/100th of a second. Keep camera on tripod and follow the subject slowly as if you are tracking them, in the direction of their movement while clicking your frame. It can easily take a lot of frames and adjustments with the shutter speed before you get the desired effect. This is performed by zooming into your subject during a long exposure. Shutter speed can vary from a second up-to 1/20th of a second. It is recommended to keep the subject and focus point in the center of the frame to create the blur streaks leading to the subject. A stationary subject like a grazing zebra or even your pet cat/dog is ideal for trying this type of shot. I have had great fun trying such shots and received really great feedback on them. I hope this tip is helpful for you to go ahead and try similar shots. Would love to see some results you achieve, feel free to comment or message me with your results. Happy Clicking! 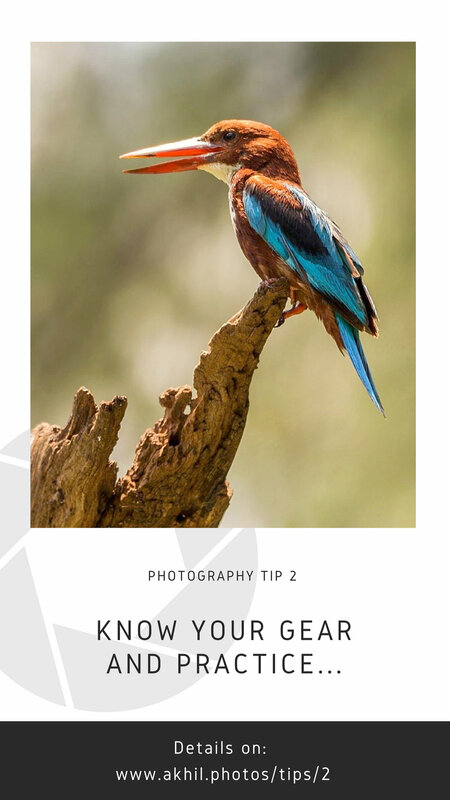 This may seem like a very simple idea, but it is a very important and strong tip in wildlife photography or videography. Wherever and whenever possible, try to shoot a subject at their eye-level (or to their "real world" perspective), to get a more appealing image for the viewers eye. For me, sometimes this means I have to get to a more elevated position, such as the top of a hill or climb trees even, to shoot certain subjects such as Birds perched on the canopy (branches) of trees or even lie flat on the ground trying to capture a bird/animal on the ground. However the difference it makes to a frame is just world's apart. 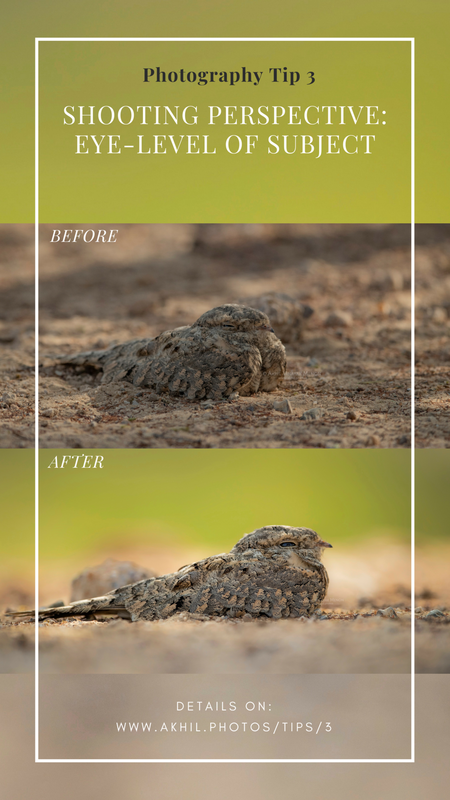 You can see this well-illustrated in the example of the image that I shot of an Egyptian Nightjar from the car (Top) and lying flat on the ground (Bottom). Of course, sitting in the comfort of my air-conditioned car in the desert heat, was the easier click and I took the least amount of effort to capture the frame as the bird was not disturbed. However, the amazingly camouflaged bird is almost difficult to spot and the image is not very impressive as does not stand the subject out against the background. Now, getting down and lying flat on the ground without getting noticed by the birds, took a lot of attempts before I found myself a patient subject, who did not fly away. Also, the ground was harsh and sprayed all over with dry thorns from the desert shrubs and pokey stones, which struck my skin (hurtful of course) or got stuck to my clothes which is a lot of work cleaning up to avoid getting hurt, further. But all this effort was well-worth it, at the end. In otherwise a very dry habitat, I managed to get a lot of green bokeh (background blur) for the subject from distant shrubs only because I took the eye-level shot. Additionally, as the ground was uneven, adjusting my position also allowed me to blur out the foreground to a good extend, allowing me to put more focus and detail into the bird. The eye-to-eye perspective helps better connect the viewer to my subject as well. Now, with a high-angle shot to the eye-level, the subject will appear smaller or weaker (lesser impact). This is often used to achieve a different perspective or a miniaturizing shot for example shooting a cluster of insects or people from top of the building. A low-angle shot to the subject's eye-level, will help make the subject appear bigger or more dominant. A very good example when a low angle shot works well to add drama would be that of an Elephant, standing tall. An eye-level frame of the same Elephant would be neutral and not add much drama or appeal. So try all angles possible to nail a good appealing perspective. Eye-level photography perspectives are not just limited to wildlife but to any kinds of photography that involves a subject. So please think about this tip while composing your frame before you shoot your next subject. Happy Clicking!